Are there times in your life when you feel like you have to do it ALL? As women, we have a lot on our plates, don't we? I don't know about you, but for me it can be very hard sometimes to say no. I've been thinking a lot about this lately as other opportunities have presented themselves to me at this time in my life that I have had to say no to simply because I have come to the realization that I cannot do it all. There have been a couple of wonderful things happen in my life this past month. I became a grandma on March 13 to a precious baby boy. I took on a babysitting job for my Pastor and his wife. I had the sweet pleasure of helping my daughter during the first two weeks of my grandson's life until she developed a comfortable routine with him. This meant spending the night with her and getting up every 2-3 hours with her when she breastfed. I helped with diaper changes, cleaning the kitchen - anything that my daughter needed. We had lots of great moma/daughter time together at night watching one of our favorite shows, Gilmore Girls, on Netflix. During the daytime, when her husband was home from work, I would go back to my home with my son and husband. I would do my Bible study with Good Morning Girls, my blogging VA responsibilities for the next day, homeschool my son, clean the house if needed (my husband kept up this area so that thankfully it did not overtake me), fix supper, eat with my husband and son, and then head back over to my daughter's house in the evening. It was a precious time as well as an exhausting time. After 2 weeks, as hard as it was for me, I decided it was time to let my daughter venture off on her own at night with her new mommy duties. I felt sure she would be fine and could handle everything without me. But I reassured her I would be there in a moment's notice if she needed me. I encouraged her in how well she had been doing with her sweet baby and the confidence I had in her that she would do fine. I'm thankful to say she did beautifully without me. I'm so proud of her! I learned a very valuable lesson during this time that I had to admit to myself and to my daughter. I can't remember the situation, but there was a moment during that 2-week period that I was with her that she was in tears and commented to me, "I don't know how you do it all." I guess the mommy weariness had taken its toll on my precious daughter to bring these words out of her mouth. ...and I reassured her that she would be able to do what God was calling her to do because His strength would be working through her weaknesses. My sweet friends, His strength will work through your weaknesses too. He does the same for me. But He said to me, "My grace is sufficient for you, for my power is made perfect in weakness." Therefore I will boast all the more gladly of my weaknesses, so that the power of Christ may rest upon me. For the sake of Christ, then, I am content with weaknesses...For when I am weak, then I am strong. So I will gladly admit to my daughter, and to you, that I cannot do it all. For that's when the power of God rests on me. I want His power in my life, don't you friends! I want His power in my daughter's life too. When you realize and admit that you cannot do it all something freeing happens. Not only does Christ's power rest on your life, but you become more discerning with your time. 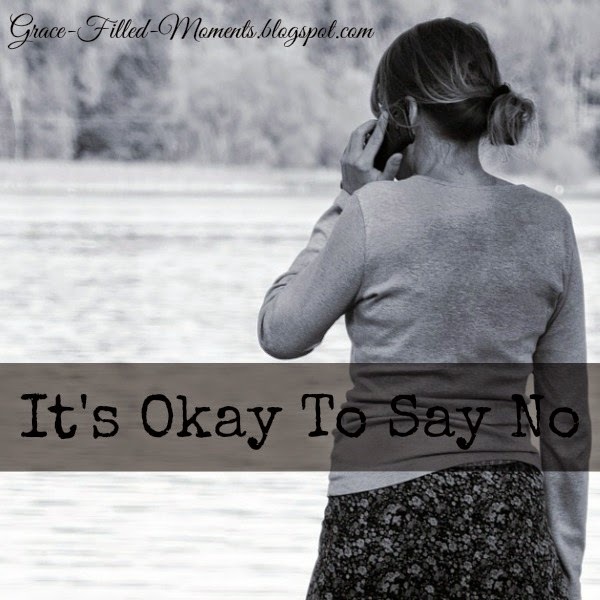 You realize that it's okay to say no to some things that beckon for your time. How about you? Do you find it hard to say no or have you come to the realization that you cannot do it all and that it's okay to say no to some things?